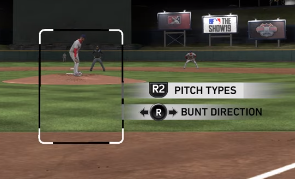 Ramone Russell breaks down the recent MLB The Show 19 gameplay trailer, which was released a couple of days ago, and points out some of the things you might have missed. We’ve listed some of those details below, but make sure to watch the video for the full breakdown. Tony Gwynn had 2 versions of himself, 1 from earlier in his career, one from later. Those cards will have different attributes. Really looking forward to that gameplay stream now. Branching to make a play after an error or knocking a tough hard hit ball down.....cool stuff. We already had bad reads and jumps on fly balls but it looks like they tuned it even more. Defense will matter more. Also.......start a career with a legend player looks like it will be a reality (Babe Ruth and then the tier team select screen). Again though......want to see franchise mode and presentation stuff later on this month. It is critical to me. The new tag system does look good. Not a RTTS or DD guy, so the rest, even the legends, honestly doesn't interest me at all..
Sure hope they have the option to use solid colored socks without the MLB logo/team marking. Realistic and up to date no doubt, but without a slew of new throwback uni's or a creator it would be a big knock to the retro crowd. Not even worried about gameplay, will be solid like usual. Edit: Noticed when they dropped the trailer but forgot to mention they have new Mariners throwbacks in as well. You can tell by them not having that nauseating MLB tag on the back of the pants. 3. RTTS was worked on. Will have to wait to see how much changed in that stream to clarify what all changed in RTTS. They made a point that they had several developers working on RTTS to improve it this year. Isn’t that just the influence of which direction you want it? Can you bunt with the right stick in 18? I thought it was only triangle. Hope there’s an option to get rid of the R2 label and the new bunting one. Pleeaaaase. Why do I get the feeling that I was being talked to like I was a 12 year old kid?? Nothing that hasn't been broken down yet, just again iterating how RTTS and DD show up in the trailer but no Franchise info. I hope they have got fielding right this year as last year they put so much emphasis on adding all these impressive, spectacular plays, they ended up being triggered all the time by everyone. I like the idea of Trumbo taking a bad jump, but that can't be the extent of a bad fielders limitations. I'm seriously hoping the more "difficult" animations come with a higher fail percentage, hugely reliant on the players defence ratings as that's the key problem imo. The fact that it was followed up by an unbelievable one handed recovery play by Max Muncy is a bit of a concern on that front. Last year on default settings, even a team of horrible fielders frequently looked like a team of the greatest fielders of all time. IF they have successfully addressed that then it will be a huge improvement. They mentioned 4-5 devs working on RTTS and only have 1 working on franchise? SMH. The one guy must be the weird dev nobody really likes. And 4 guys worked a whole year to change the bus and plane on RTTS? Does that make one single person decide they are buying this version? As opposed to adding expansion/relocation/custom jerseys or full minor leagues in Franchise? I am nervous about franchise this year not about it getting anything new but even if it will still be there like it once was! I did not play 18 but in 17 I recall influencing bunts with the analog stick. EDIT: just looked at the controls, last year it was the left stick. They just moved it to the right stick from the screen. 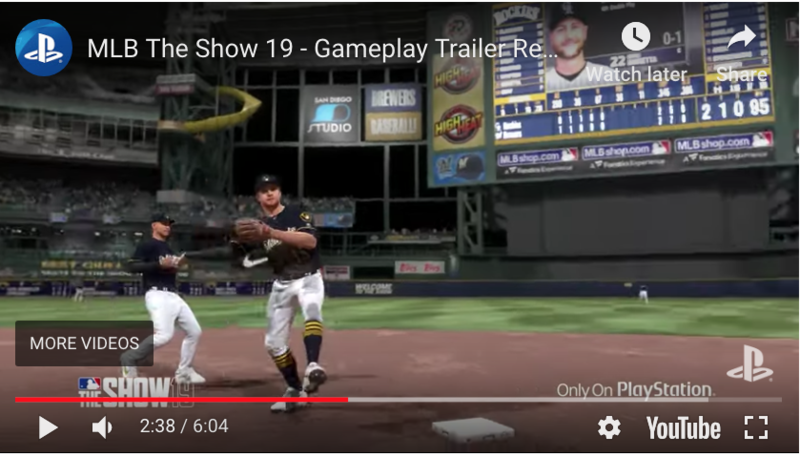 Pinging Armor and Sword - directional hitting confirmed still in the game by an RTTS clip early in the video. Can never be too sure with how much flak that hitting mode takes from the online crowd. They have been talking about these types of awareness and defensive improvements for the last couple of years. Let's hope it's more legit this time around. As this is a make or break area for me. A tell tell sign from the past is seeing how Corey S makes this incredible accurate throw from beyond the second base bag even though his momentum is taking him the opposite way! No foot plant or weight shift just a spin and bulls eye throw. The Dansby Swanson play looks good and shows urgency but I feel like that exact same animation will be canned or cookie cutter for every infielder. A lack of variety in these animations takes away from the feel of the game as well as makes every player look the same. They then show the Matt Chapman 3rd base clip and his stellar defense. So it's definitely a wait and see if there is a wider gap between fielders on defense and if it actually works! Have you been watching baseball lately bruh? There is more info on the screen than ever, which is why I don't understand how they call it broadcast, when the show is far behind broadcast baseball. Back in early to mid 2000's people wanted the show to mimick television broadcast with minimal to nothing on the screen, and they have been stuck there. Now baseball mimicks videogames with an info war of OSD's and situational statistics, and I'm all for it, I just wish SDS was as well. I highly doubt they will remove the mode. But I hear your frustration. They add year to year saves which is IMO the best franchise feature of any sports game. But the mode itself is way behind the other sports games in content/options/customization. It’s such a tease! No greater example of this than K - Zone, the superimposed strike zone graphic over the actual home plate. That's 100% a video game feature moved to real life. I didn't watch the video but when I saw the still I just assumed is was that batters eye feature that became enabled when you held in R3. Really liking what I'm hearing about the improvements to defense. I thought '18 was a step in the right direction of making defense "fun" and separating gold glovers from poor defensive players, but its good to see that '19 defense has been expanded upon even further. Really cannot wait for that stream to take place next Thursday. Also intrigued by the comment Ramone made about more hit types in '19. Eager to see what these are. Again, waiting for that twitch stream next Thursday. Really cool seeing all the defensive improvements, but this has me wondering if scoring will be possible in 2019? Thank God for sliders. Those animations of Matt Chapman and Corey Spangenberg both having the ball in their gloves until after they tag the base and start jumping bother me soooo much. The ball would be in their hands ready to throw by then. Oh right on, very cool. Well hopefully it stays that way then, but this makes me feel much better. Thanks man. I predict that the gameplay changes to defense will be amazing at launch and then get ruined throughout the year by patches because of complaints by online and D&D players. I know getting individual historic teams for baseball is difficult due to the number of players and all, but 130 would allow for 5 teams (25 man rosters with 5 left over) that would be cool to play in a season mode where you could replace teams and the likes. Would be so much fun to do something along those lines. It would be great if once unlocked the legends would be available for importing into the risters of other modes such as RTTS or Franchise. You can allow legends in franchise, no? You sure can, after you pick your team theres an option to allow legends to franchise. Pretty sure that was an option in 17 as well. Also everyone "liked" that comment about the bunting but youve been able to bunt to either side of the field for years too. Looks like there are multiple stance socks options per team now. That wasn't the case in 18. Looks like they'll change based on what uniform you select (Which is how it should be). Hopefully that is the case this year. If they did implement this for 19 the Kudos to Sony for that. RTTS was kind of due for an update, so that's a good sign. I want to see what's in the reveal in two weeks, but if they're FINALLY giving the user someone else in-universe to care about, that alone could be worth the price of admission. AND they say they have something else in there, too. This just got interesting. Saw the Padres one too. Just forgot to mention it. Definitely looks like they did the right thing this year with the Stance socks. You know, the fact that Franchise doesn't get it's own stream is setting off all kinds of alarm bells with me, but contract extensions and better post error reactions and fielding efficiency improvements are actually big deals for me, especially since I crank that error slider up. Now all I need to know is the Blue Jays alternate cap finally in the game? You guys think I'm kidding. I am not. Oh yeah, and a double check to make sure year to year saves are still a thing. I suspect so but I will never take it for granted. I can't imagine the backlash if they took out year to year saves. That would be the end of OSFM. I can't imagine they'd start from scratch after already having the roster mostly done having worked on it for months. Taking out year to year saves would be a legit disaster from a roster standpoint. I love the further focus on the defense side. The one gameplay area where there were still the most headscratch plays sometimes. Focusing on defence is definitely positive. But the lack of even acknowledgement of Franchises existence is frustrating. Unless there’s literally nothing to report which is disappointing. Didn’t buy it last year for the first time in 10 years and still on the fence this year. Maybe two years of gameplay improvements is worth it? Or maybe it’s time to stop playing baseball video games? RTTS was kind of due for an update, so that's a good sign. * I want to see what's in the reveal in two weeks, but if they're FINALLY giving the user someone else in-universe to care about, that alone could be worth the price of admission. * AND they say they have something else in there, too. * This just got interesting. I am a long time RTTS guy and I have to say that RTTS has been getting incremental updates every year. So, I am guessing that they have just not been updating what you wanted to see. 17 saw the limited storylines and interactions with coaches and managers and the narrative feature. 18 saw a huge update with the addition of Archetypes and a new training scheme. 19 looks to add even more updates with the new skill tree shown in the video. So RTTS is getting constant updates. Listen “bruh” ! Guess what, I’ve been watching more MLB.TV games than the average here maybe. I just don’t understand why you said that. My point is not less stats or broadcast info but having the option to remove online help like R2. Iit’s not needed to be displayed on screen when you’re an experienced user. I know you can turn it off but it’s turning off the functionality as well. The developers of this game do a better job of promoting the game than any other sports video game on the market. That said my experience in franchise-manage mode is I never know what gameplay is until I play the game for a few hours myself and even then gameplay changed as the game is patched. I’m 99% sure that the screen with contenders and underdogs has nothing to do with franchise mode, it’s most likely for that new march to October mode. And maybe I’m being too optimistic, but I don’t think they would ever take out franchise or get rid of 30 team control. I know they try to appeal to the casual gamer a lot, but I feel like they vastly underestimate how much of their customer base plays franchise almost exclusively. Some good stuff in there though, especially with gameplay. More animations, situational awareness, error recovery and outfielders first step.. all that looks good! They don't underestimate it. They can see how much time is being spent on all the modes. Dont remember if it was last year or the year before. But I believe they showed how many games were played in each mode (could have been innings or hour spent or something like that) and Franchise was last out of DD and RTTS. They are probably the only ones that know exactly how much of their customer base plays franchise. Remember that our profiles shows that info. If they don't have sales numbers for the total number of units sold and also reports on what percentages of those players actually play each mode then I would be shocked. I honestly believe that OS gives many a false sense in just how popular Franchise mode is. I bet it is a lot fewer than many here would expect. Compared to DD and RTTS I doubt the number is significant. And you can say they are catering to casual fans and gamers but after trying DD the last few years and seeing the time and effort it takes to achieve those goals and finish those programs and missions, and seeing how many hours people invest in that mode I am not sure I would ever call them casual. I am more casual than that group and that is part of the reason I am drifting away. I'm very pleased overall with the updates this year, but then again...I didn't have a huge problem with last year's game. Also, Jason Kendall is not a "legend". That actually made me LOL. Meh. 3x All Star, hit over .300 six times in his career, stole 20 or more bases three times, lead the league once in caught stealing % and blocked pitches and had an OBP of over .400 three years in a row. Factor those offensive numbers for a catcher who also played well defensively and they could have done worse. Not arguing he's a "legend" perhaps, but the dude could play ball better than most. I don't mind seeing underrated guys get some nods every now and then. Error reactions looks like a nice detail. So is that filer at then end with Mays in the game or not? Or is it already in the game? Been a while since I played this series, a couple of years now. Someone made the point in another thread and I thought it was spot on: that’s a self-fulfilling prophecy though. “Not enough people play franchise, guess we don’t have to really touch it”; “we haven’t touched franchise for years, now fewer people than ever play it” - well who woulda thought people tend not to play neglected game modes that were stale five years ago. That’s only because DD was mainly three inning games!! Franchise and RTTS build this game and this franchise fanbase but guess what the owners m developers of this game have forgotten but I promise you they will soon realize ! !OOTP and RBI baseball is there only competition but there revenue shares is gonna take a big hit this year if the only thing they touched in franchise is in season contracts this game will take a severe hit especially if OFSM is not no longer connected because they are the only reason franchisers have bought this game !! I'm just glad this point of view is gaining a little more traction around here. To paraphrase the great James Earl Jones: if you don't build it, they won't come. Problem is a lot of people's willingness to give the Sony devs the benefit of a doubt has worn thin with repeated neglect over multiple development cycles. Being repeatedly told that the thing you most desire in the game is of frankly little concern to them, even when they state things in a way that's a bit more open ended, is a bitter pill. While you understand the profit motive that a business must have, as a consumer this understanding doesn't really substitute for genuine enjoyment of the game. It doesn't substitute for them showing you, through their actions and decisions, that your $60 doesn't really matter to them all things considered. And while it's probably not reasonable to question why a mode like DD gets attention, I think it's certainly reasonable to question whether they should be focusing on it literally at all costs. All that said, I'm about 50:50 on whether to purchase this year. There are some nice looking things in this trailer rewind and I feel better about it after Ramone pointed out some things. I didn't get '18, so I am viewing my decision as whether the combined upgrades in '18 + '19 are worth it. I think with a 2 year period, the list of upgrades becomes a little more substantial. We're talking contracts + phases + AI + retirement logic + better colors + defensive urgency + tagging animations + bad jumps and so forth. Seems more substantial even if franchise gets the shaft once again this time around. Maybe we'll be pleasantly surprised. Not likely, but who really knows. Wish they would add the stance socks the braves actually wear. I honestly thought the changes to franchise were worst last year. The logic for budgets made 5 years down the road the same as the past before it was corrected in prior games. You would see numerous 80-90 overall players go unsigned. I will be really shocked if that is in the game! So with the emphasis on defense in this video, would it be safe to assume SDS will allow more backup position options? Player editor should be consistent to what features are being added or improved. From the early viewing it looks like under the hood adjustments. Not sure it would help with editing. We will find out this week though. Same thing is going on with FIFA. They barely touch Career Mode and put all of their eggs in the FUT basket. Either they haven’t stopped to think that less people are playing the mode because of the lack or improvements or they really don’t care because of the card game money. Either way, it’s sooo disheartening as a sports fan that wants to play realistic/sim sports games. It feels like NBA 2K is the only company that takes our wants seriously. You know, I haven't had the problems that you and others have had with budgets/players going unsigned etc. I always use real contracts along with a heavily edited hybrid-style roster. I'm thinking that a lot of the stock rosters people are using are just way too loaded with highly rated players. Whereas the rosters I make usually end up with less than one 90+ rated player per team and just a couple of 80s per team. Maybe ~3-4 A prospects in the entire league. Some people have a problem using this type of roster because generated rookies don't fit in perfectly, but this is more an issue of sloppy and optimistic ratings rather than budgets/contracts imo. As true as this is, would it surprise them if less people are playing it because they are devoting less attention to it? I mean, this is a two-way street here. It's the chicken-egg paradox. They want to devote less time to franchise because "nobody is playing it," but nobody will play it if they don't devote any time to it either. It's like the days when I was young and my mom/dad would bring in mail, and I complained that I didn't get any (I mean all they got were bills haha so I shouldn't have been too jealous), but they'd always say: "If you want someone to write you, you should write them." I contend that if they left DD and RTTS exactly as is, they would still get the masses buying it and paying for stubs and such, and just let the gameplay take care of itself within those modes so they still feel some upgrades heh. Best of both worlds. This made me laugh. Your parents seem like good folks. Really can't make any conclusions from this video but it seemed the ball hit down the line curved a little but not excessively like in mlbts18. If so then that's an improvement. Other improvements would be fewer wild pitches and HBP. A couple gameplay tweaks and seasonal graphic updates. Where the meat guys?